Note: Not to scale. Space weather scientists track the path of a coronal mass ejection as well as its strength and speed. Most never approach Earth at all, because Earth presents such a tiny target in a large solar system. National Aeronautics and Space Administration (NASA) scientists observing the sun report that 2013 solar activity is more muted so far than anticipated, but that there is potential for higher activity in late 2013 as well as in 2015. Solar activity can have serious effects on electrical and communications systems. 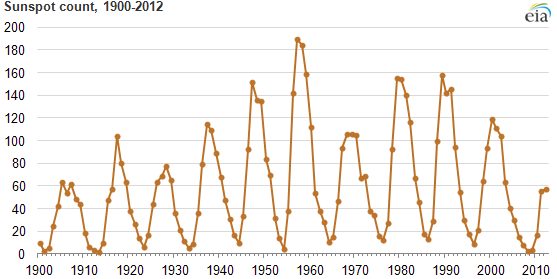 The sun goes through an approximately 11-year cycle of solar activity (see chart below). In 2007, scientists from NASA and National Oceanic and Atmospheric Administration (NOAA) predicted that the solar maximum—the peak of the cycle—would occur in May 2013. However, with 2012 and partial 2013 data now available, more recent analysis suggests that the current cycle may have two peaks—like the last two solar cycles—with high activity in late 2013 and the potential for a second peak in 2015. A solar maximum means heightened solar activity of many types, including sunspots, solar flares, and coronal mass ejections (CME), as well as small changes in the overall amount of energy coming from the sun, particularly short wavelengths like x-rays. However, it is the CMEs that have the potential to harm electrical systems. A CME is a transitory structure of magnetic fields and charged particles in the solar atmosphere that becomes violently unstable, flinging sun-material (charged particles) into space. 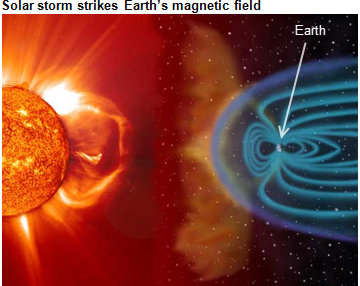 If a CME hits Earth, the matter in it has the potential to disrupt electrical systems because of the interaction between long metallic structures (like transmission lines) and transient electromagnetic fields created by the motion of many highly energetic charged particles coming from the sun. Although the probability of such an interaction is fairly small and such events are rare, the effects can be damaging enough that electric grid operators take this possibility seriously. Typically, charged particles are funneled toward the North and South Poles by Earth's own magnetic field—one of the reasons the Aurora Borealis (also called the northern lights) is seen only in northern latitudes and the Aurora Australis appears only in southern latitudes. In 1859, a particularly strong solar flare resulted in aurorae visible at most latitudes. During that event, telegraph operations—also dependent on long conducting cables—were disrupted. In March 1989, a CME overloaded equipment on the Quebec power grid, causing a blackout that left more than six million people without power for more than nine hours. While solar science and prediction capability have advanced considerably since that 1989 event, the interconnectedness of the power grid has also increased, and with it the potential for more-widespread damage. A 2012 assessment from the North American Electric Reliability Corporation (NERC) examined the potential for disruption or damage to grid components, noting the risk of grid instability and uncontrolled blackout. The report provided recommendations for managing the risks of such geomagnetic disturbances while also noting that large transformers are disproportionately affected. This increases the risk of a long-term disruption in the grid's capability to provide power because of the limited quantity of spare transformers and the long lead times required for replacement.